Holocaust Controversies: Ah, these CODOH "gentlemen"... And NAFCASH. Ah, these CODOH "gentlemen"... And NAFCASH. I notice that the mentally retarded/ill cowards and liars at CODOH Watch have yet to make any comments on the NAFCASH site, much less accept any of the NAFCASH challenges. What does it say about an issue when the Jews give it the silent treatment? By the way, if you haven't visited the - http://www.nafcash.com/ - site lately, The Treblinka CSI Challenge is up to $210,000.00 and the NAFCASH Forensic Challenge is up to $25,000.00. I wonder what that idiot - loser Mathis is waiting for? Just like evolution deniers, Holocaust deniers are fond of bogus challenges. Let's see what this "NAFCASH" has to offer. A detailed FORENSIC EXAMINATION of the site of the wartime Treblinka camp, using sophisticated electronic ground radar, has found no evidence of mass graves there. For six days in October 1999, an Australian team headed by Richard Krege, a qualified electronics engineer, carried out an examination of the soil at the site of the former Treblinka II camp in Poland, where, Holocaust historians say, more than half a million Jews were put to death in gas chambers and then buried in mass graves. According to the Encyclopedia of the Holocaust (1997), for example, "a total of 870,000 people" were killed and buried at Treblinka between July 1942 and April 1943. Then, between April and July 1943, the hundreds of thousands of corpses were allegedly dug up and burned in batches of 2,000 or 2,500 on large grids made of railway ties. Krege's team used an $80,000 GROUND PENETRATION RADAR (GPR) device, which sends out vertical radar signals that are visible on a computer monitor. GPR detects any large-scale disturbances in the soil structure to a normal effective depth of four or five meters, and sometimes up to ten meters (GPR devices are routinely used around the world by geologists, archeologists and police). In its Treblinka investigation, Krege's team also carried out visual soil inspections, and used an auger to take numerous soil core samples. 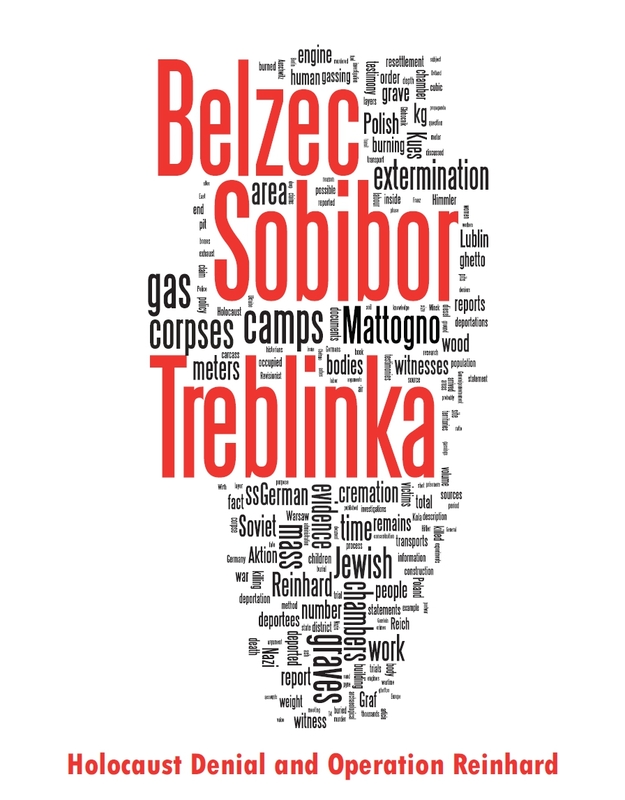 The team carefully examined the entire Treblinka II site, especially the alleged "mass graves" portion, and carried out control examinations of the surrounding area. They found no soil disturbance consistent with the burial of hundreds of thousands of bodies, or even evidence that the ground had ever been disturbed. In addition, Krege and his team found no evidence of individual graves, bone remains, human ashes, or wood ashes. They found no evidence that the ground had ever been disturbed? Um, hellooo? Wouldn't that mean that there was no camp at all, the claim that even most rabid deniers prefer not to make, because the evidence for camp's existence is undisputed? (But cf. this). This is akin to a 9/11 conspiracy theorist "investigating" whether the planes could have brought down the WTC towers, and concluding that the towers themselves never existed! That is, either Krege used bogus methods OR he incorrectly interpreted the results. There are also other traces. For example, in the north-eastern part, over a surface covering about 2 ha. (5 acres), there are large quantities of ashes mixed with sand, among which are numerous human bones, often with the remains of decomposing tissues. As a result of an examination made by an expert it was found that ashes were the remains of burnt human bones. The examination of numerous human skulls found in the camp has shown that they bear no traces of external injuries. Within a radius of several hundred yards from the camp site an unpleasant smell of burnt ash and decay is noticeable, growing stronger as one approaches. You can read more about Krege's idiocy here and here. Some nifty details there. It will suffice to say that it's been 7 years, and Krege still has not published any report about his alleged findings. Actually, recent research indicates a lower number of ca. 800,000, but that's beside the point (although the challenge is already unanswerable because of that). The problem here is that no one claims that these bodies are still there. They have been burned in 1943. 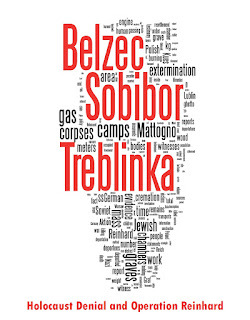 In fact, if we were to find the bodies of 800,000 people in Treblinka today, that would mean that what we think we knew about Treblinka would be patently false, because, to repeat, the bodies have been destroyed. And of course one cannot quantify from the remaining ashes, pieces of bones and other remains which are still buried in Treblinka soil any meaningful number of the victims, even if one were to suppose that no ashes/remains were taken elsewhere. I.e., the challenge cannot be met in principle, not unlike Kent Hovind's evolution challenge. It is totally bogus. The same applies to their second, smaller challenge too. Actually, even if the rules were not so idiotic, one wouldn't be able to perform the excavations anyway, because, whether one likes it or not, the site is considered sacred, for an obvious reason. The only reason for some sort of excavation to be permitted by authorities would be to delineate the area of the graves themselves, for the construction of a monument (Jewish religious law forbids disturbing human remains). This is what was done by Prof. Andrzej Kola, who has found numerous graves in Belzec extermination camp area, and numerous human remains (see his report Belzec. The Nazi Camp for Jews in the Light of Archaeological Sources. Excavations 1997-1999.). But since there already is a monument in Treblinka (probably built without regard for religious sensibilities), this option is unavailable. Finally, but most importanty, nobody is going to dance to the denier pigs' tune and disturb the remains of Treblinka mass graves just to appease them and meet their "challenge". Maybe these mental midgets don't know what dignity is, but we do. You are right Haldan, point taken. But it's just so hard to resist when the people we are talking about are in fact cowards, liars, idiots, losers, etc. The fact remains, the members of NAFCASH have put their money where their mouths are, and CODOH Watch gives them the silent treatment. How else can you describe that without using the word coward? Yes, we're dealing with cowards, liars, idiots and losers, as is evident from the above comment. Interesting. A lot of information that the holocaust did not happen, or was much smaller than the "6 million Jews" story that I was taught as a child," is available now with the internet. I'm not an expert, and just beginning to look into this, that is, if I do look into it. I'm not going to comment on that. If it turns out that the holocaust DID NOT happen, or was much less than the official story, one thing is for sure: There is going to be hell to pay for the Jews. I see there is a mention of evolution denial in the post. Is this the right sort of evolution thats used to bash fundamentalist Christian Creationists (Israel's most steadfast allies in the US ironically). The sort that has little implication for day to day life but which you like to dwell on at great length. Or the wrong sort, the sort that would imply that human groups (thats races btw) have evolved, on average, detectable differences in abilities and capabilities over multiple generations. The sort that fundamentally impacts on crime, education, economics, international policy, immigration etc. In other words the sort you do your best to completely ignore. Hope you can clear this one up for me chaps! I think you've missed the point of the NAFCASH claims, here. They weren't saying that the grounds of the camp weren't disturbed, and therefore no camp had ever existed, and to read it as such is just stupid. They are saying that the areas claimed to have been used for these mass burial pits have been demonstrated, by ground penetrating radar, to have all of their strata layers intact, thereby clearly pointing out that no pits or diggings ever occurred there. Also, when you claim that the bodies were destroyed, you really should look into the cremation process for human bodies. No physical matter can be created or destroyed. NAFCASH are just pointing out that the remains of 800,000 bodies would leave some evidence, either in the form of bones, ash, teeth, or other remnants left behind after cremation. At first they patiently wait for the holocaust victims to die one by one; only a tiny fraction made ever it out of the hell-holes, and most of them are already dead. Then they wait for the other witnesses to the horror to die; many have found their rest; remaining are already on the way. Then they argue vociferously about the minor discrepancies and irrelevant details. Then they argue about number of gas chambers and the mode of killings. .."there were beatings and shootings and starvation but no gassings"
"there were only beatings and starvation no shootings !" After a few more years..
"prisoners and the SS were treated by the same doctors"
"they were fed the same food as the SS"
"new evidence suggests the SS even shared their quarters with the Jews"
"selections were to separate the weak and people so as to give them rest and medical attention if needed"
By now they have started removing the trailing zeroes from the 'number' of victims killed; enough zeros to reduce the scale of the slaughter as they did with the degree of brutality. "there were no concentration camps in Hitler's Germany"
"the NAZIs never ran any concentration camp anywhere in the world"
"no prisoners, only factories which provided decent wages for honest work"
"The holocaust never took place" .."the old black and white snaps showing unimaginable horrors were 'manufactured' by the Zionists !" "we have evidence to prove that Jews in Europe may have been killed by the Zionists"
"Some Jewish communities commited mass suicides. This abberant behaviour was also reported among the Gypsies, invalids, gays.."
"Jews never existed in Europe in the first place. That is why we don't see any of them here"
And now the icing on the cake..
"Mengele was an the best doctor at Auschwitz. The 'factory' records reveal that he served it's inmates day and night with due diligance and care"
"actualy Eichmann was a Zionist"
"Himmler was also a Zionist"
"Even Bormann was a Zionist"
"Our historian managed to get a old bundle of letters that suggest that Hitler might have actually been a .."
"holocaust ? hmm let me think"
Now they can stop lying and catch their breath! Millions have been massacred in Vietnam/Russia/China and no one had problems believing it. Millions of Russsian POWs perished under the Germans during WW-II but nobody asked for the bodies to tally the count. But they demand proof of each of the six million Jews massacred by the Nazis !